It is exactly as I expected and should match the new home perfectly. I have not moved yet. The comforter looks very warm and comfortable. I'll let you know later if it does not meet my expectations. For now, I am very pleased. Crafted with a simple style that is still intensely stylish, this comforter set from Eddie Bauer features topstitch detailing and a cozy cotton flannel plaid reverse. The Cinder grey coloration with grey and white plaid reverse has modern minimalist appeal, but you can choose to push the look to a more traditional casual mode by adding plaid flannel European shams and novelty accent pillows also available from Eddie Bauer. I love this comforter!! We bought it for my son's queen bed. We are in the process of moving and I don't currently have a comforter, so I have been using this Kingston comforter for the past month. I should have purchased myself a comforter a while ago, but I am in no rush while using this super comfortable comforter in the meantime. The flannel on the plaid side is so soft! This comforter keeps us warm, but not too warm! We like thickness of the comforter. It is not flat and you can tell that it is good quality. I'm thinking Eddie Bauer makes good quality products in general, I just wish there were more options than the majority being plaid. I feel like the color of this comforter is more of a steel grey than a grey/blue. I don't know why but the picture looks somewhat blue to me. We had no issues with the packaging or with any odors. We literally pulled it out of the packaging, put it on the bed, and it hasn't moved since. I have not needed to wash this yet. I'm so happy I got such a good quality comforter for my son! Purchased for myself. Wasn't my first choice, but elated I chose it! Can use it year-round. Comfortable cotton during spring and summer, warm flannel fall and winter. Enjoying it immensely. Color is more of a blue-grey, than grey, but it's growing on me. 😊 Quality exceptional. As expected, Eddie Bauer receives two thumb-up. The wrinkles have since come out. Great quality and so comfy! Love this comforter. Perfect for winter. Love the reversible feature and that it’s flannel in one side. It’s stylish yet cozy. Highly recommend. I purchased this for my son’s first apartment. The package arrived much quicker than anticipated! I am very pleased with the comforter, and the dark grey color is perfect! I also purchased the matching grey checked shams. Beautiful bed! Love my subtle Charcoal plaid reverse comforter. Good color and quality of material. Considering buying the navy version. This is my 3rd Eddie Bauer comforter set and I will definitely be buying another after this! Each time I have purchased a reversible set but in different colors/prints. I have been extremely pleased with all the sets. They are durable, comfortable, wash well and look great. I specifically chose this set since my last ones were excellent. I only buy a new set to redecorate not because they wear out. I always pass them on to a family member who loves them as well. I really like this. For this good price, this is a heavier, more substantial comforter than the one I had. The charcoal color is great and the reversible option as well. The shams are easy and look good. I think I may look and see if there is a sheet set with pillowcases that matches all this! The comforter is a nice weight, not too thick but seems warm enough, and the plaid side is a nice soft flannel. I was worried that the solid side was going to be stiff or coarse but its not. Just ordered another Eddie Bauer set for our bed (this one was for the guest room). This is a very nice quality heavier comforter. It is a nice size, with room to hang over the sides of my bed. My bed is the very deep mattress, and this works nice. Its more manly I would say, not a feminine comforter. Love this bedding! SO soft and comfortable for my son's first big boy room!! 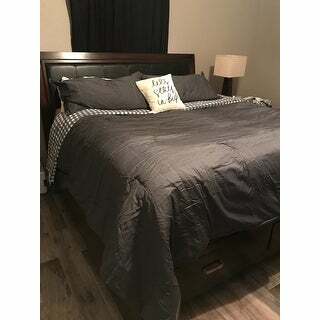 Was very happy with the quality and with the color of this comforter set. I would highly recommend this to any little boy!! I was looking for something that was a middle ground for my husband and I. The comforter is really thick and warm. It looks just like the picture. I would purchase again. We actually ordered a king size for our queen bed. I personally like an over sized comforter and this one looks great on our bed. Not too big, very well made, and also keeps us warm. This set is super comfy and seems to be a great quality. It's very large, which just makes it better for me, but everyone might not appreciate that. My only complaint is that I will have to wash it at the laundromat, so it won't get washed as often as I'd probably like. The underside is so soft and warm, it's definitely my favorite part. "Where can I buy the matching plaid pillows?" "Is the white in this comforter a true white or more on the ivory side?" "What pillow sham comes with it? The solid charcoal or the plaid?"